Can the topology of microobjects influence the way they move in a fluid? 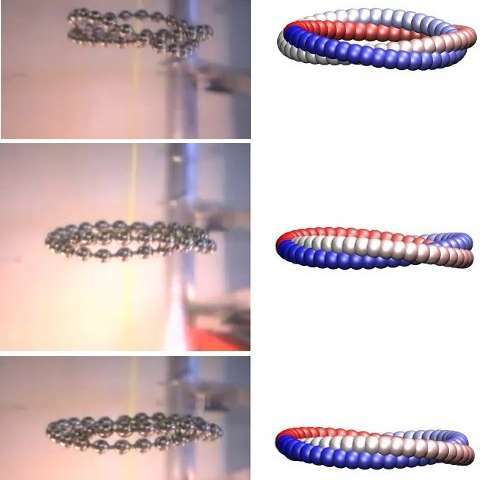 Experiments and simulations of Polish and Swiss researchers published in the Physical Review Letters show that the dynamics of elastic chains settling in a fluid depends on the way they are knotted. The settling chains form flat, toroidal structures composed of several intertwined loops, which swirl around each other. The study is important for the proper interpretation of sedimentation and centrifugation experiments of biomolecules. In 1867 two Scottish physicists, Peter Tait and William Thomson (Lord Kelvin), were studying the motion of smoke rings produced with help of a special apparatus. They were fascinated by the stability of their motion—soon after the rings formed, they took a toroidal shape and translated without further changes of form. A smoke ring is a special form of a vortex, in which its vortex line forms a loop. Kelvin showed that in an ideal fluid, such a vortex would persist forever. In particular, as he argued, a vortex line tied into a knot would never untie itself. Kelvin speculated that the atoms themselves might be knotted vortices circulating in the aether, with different knot types corresponding to different chemical elements. Even though this concept did not stand the test of time, the investigations of Kelvin and Tait led to a new branch of mathematics—knot theory. In physics, knots, links and other systems of nontrivial topology are also increasingly widespread. Knots appear in magnetohydrodynamics describing e.g. the plasma flows near the sun, in the construction of fault-free schemes of quantum computing, in quantum field-theory and in Bose-Einstein condensates. Topology is also important for the functioning of biological systems. Due to its extreme length, DNA is easily tangled, just like earbud cords in a pocket. The cell then needs to recruit special enzymes (topoisomerases) to untangle the DNA. DNA knot types can be determined experimentally by putting the DNA into either an electric field or using a centrifuge. As it turns out, DNA loops of different topologies move with different speeds under the action of an external force. What is the underlying reason for this connection between topology and dynamics? Piotr Szymczak from the Faculty of Physics, University of Warsaw, in collaboration with Magdalena Gruziel and Maria Ekiel-Jezewska from the Institute of Fundamental Technical Research of the Polish Academy of Sciences, and Giovanni Dietler, Andrzej Stasiak and Krishnan Thyagarajan from Lausanne, investigated this question. To better understand the unexpected connection between the topology and dynamics of DNA, they designed a macroscale experiment in which the role of the DNA was played by knotted steel beaded chains. The chains were suspended in a highly viscous silicon oil to make sure that the character of the flow around the centimeter-sized chain is similar to the flow around the microscopic DNA loop in water. While settling in a viscous fluid, the chains behaved in a rather unexpected way, not unlike the smoke rings of Tait and Kelvin. After an initial rearrangement, the steel chains attained a flat, torus-like configuration in a plane perpendicular to gravity. The torus consisted of one or more intertwined loops, incessantly swirling around each other. The number of loops and the way they intertwine depend on the particular knot type. Additionally, the entire structure rotated around its axis, in the direction determined by the handedness of a knot. To explain the surprising behavior of settling knots, the team created a theoretical model of elastic filaments moving in a viscous fluid and simulated their motion numerically. The simulations fully reproduced the dynamics observed in the experiment. 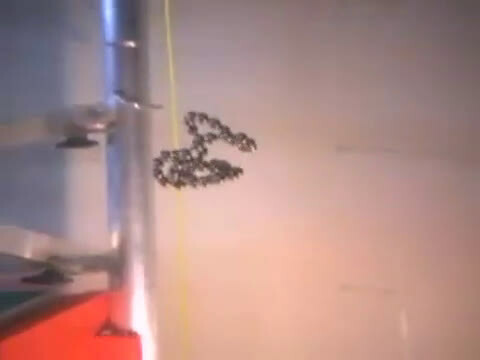 Mathematical modeling established that the coordinated motion of the loops is due to the hydrodynamic interactions mediated by the fluid—the movement of one part of the chain induces a flow that affects all the other parts and leads to the synchronized swirling. The characteristics of the motion depended on the stiffness of the chains and the chain lengths. Interestingly, this demonstrates that the vortices of Kelvin and Tait, if tied in a knot, would execute exactly the same motion as the settling chains. The settling chains can thus be seen as visualizations of Kelvin's vortex atoms, if they existed. The most important result of this work is the demonstration that elastic knotted loops form stable, toroidal structures while settling in a viscous fluid. This result is important for the proper interpretation of the sedimentation and centrifugation experiments, as it challenges the assumption that DNA settles under gravity in form of a disordered lump.